If you're suffering from edema - a condition of swelling due to water leaking into cells and tissues from the bloodstream - you may consider avoiding foods that cause water retention. While many factors can lead to water retention, studies have revealed nutritional intake high in sodium contributes significantly. Even as health-conscious individuals attempt to cut salt from their diets, they often consume foods unaware of hidden sodium content. The human body is sensitive, always trying to maintain homeostasis at the cellular level. Your cells are filled and surrounded with water. Around and within those cells, specific water percentages are controlled by chemical processes which involve sodium and potassium levels, hormones, and proper kidney function. Generally, if you are taking in an excess amount of sodium (which is very easy to do in today's society), the mechanism which expels water from your cells is inhibited, thus causing them to swell. This is the basic science behind sodium-related water retention. Keeping the salt shaker at bay is very good practice, but here is a list of foods that may try to smuggle sodium into your diet! 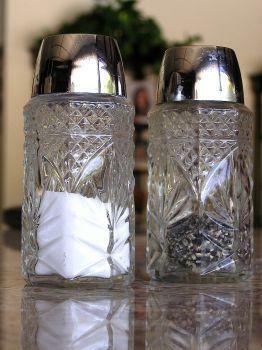 Often they contain salt as a preservative; preventing foods from spoiling by inhibiting the growth of bacteria. Additionally, sodium enhances flavor, prevents excessive dryness in snacks, and makes sweets taste even sweeter. It can also mask unsavory metallic and chemical essences that accompany many prepackaged and processed products. Ham, bacon, roast beef, chicken, cheese, butter… the list goes on and on. All of these processed items are packed with sodium. Bacon alone contains an average 2,700 mg of sodium per 100g. Canned foods such as soup, beans, and olives almost always have a high sodium content. If you include them in your diet, be sure to track the amount of sodium per serving. While microwavable dinners may be convenient, there is usually a great deal of salt keeping these meals from spoiling. Frozen dinners, instant meals, and toaster snacks are also culprits. A world without chips and cookies may sound dismal. Still, these tasty snacks along with crackers, pretzels, and many others can come packing a sodium punch. Although it may seem like your local grocery store is stocked with nothing but foods that cause water retention, there is hope! Pay particular attention to the sodium content of products as it is listed on nutrition labels. The USDA recommends no more that 2,300 mg of sodium in a day. Additionally, you can benefit from consuming foods rich in potassium including vegetables and fruits. Exercise is a great way to battle edema. When you engage in physical activity your blood vessels expand and in turn, fluid is transferred from tissues into the kidneys. This water is eventually excreted from the body. Simply walking thirty to forty minutes three days a week can make a difference.